The Lunch Project "Aozoranomukoude Project" from Japan A proposal to provide the funds and materials for community to start a fish farm, chicken farm and vegetable garden. 1. To provide food and nutrition for the daily lunch needs of the large number of students. 2. Enable self-sufficiency and sustenance in the community, hence eliminating the need to depend on unpredictable external forces for food necessities. 3. To improve the nutritional habits of the student and local community, which is based on a solely carbohydrates-based diet. 4. To create opportunities and some skills to the local students, who will take up the task of caring for the farms and gardens thereafter, with uidance from the teachers.
" Build a chicken farm 26 Feb, - 14 Mar, 2002 "
Client: Intel Microelectronics (Thailand) Ltd.
Summary: Intel Technology Asia Pte. Ltd., Singapore, in cooperation with Intel Microelectronics (Thailand) Ltd., The Rotary Club of Singapore, and Thai Youth Hostel Foundation have developed ‘Project International Action' program to provide computer systems and education materials to less privileged rural children of Ban Pang Huay Tat School in Mae Tang District, Chiang Mai Province. 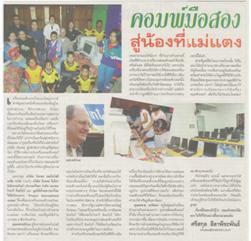 Intel also gave the mobile PCs to the Thai Youth Hostel Foundation in Chiang Mai. According to Jeff Stearns, the donated mobile and desktop PCs under this program were used at Intel office. Actually, when the time for replacement has come, Intel will donate the old systems to less privileged children all over the world to maximize usage of the systems. Somchai Jongwattana, principal at Ban Pang Huay Tat School was also quoted as saying that the computers will be very useful for the school, especially the teachers. The ministry of education has sent them several educational CDs but they cannot use the CDs due to lacking of computer system. Now, they can make it with computers donated by Intel. At Pai District, Mae Hong Sorn Province. 2. "Rotaract Club of NUS Project" to build a 4 classroom building for the Lahu Hill Tribes. To add on to the existing school to cater to the growing education needs of the village at R.O.Yama Border Police School, Fang District, Chiang Mai, Thailand. From 25 May - 15 June, 2002. Support by Singapore International Foundation (SIF). 3. "Operation Orion 2002 Project" to `uild a Multi - purpose Hall for the villager, which will serve a s a meeting hall and also as an activities center by student team from National University of Singapore(NUS),at Tambon Khun Kuan, Pong District, Prayao, Thailand. From 10 June - 03 July, 2002. Support by Singapore International Foundation (SIF). 4. "Operation Awakening Hope Project" Kaki Buki Center. To build a new dormitory for the school to cater to an increased population, to repair the stairs and extension of kitchen at Ban Pang Kao Larm Boder Police School, Chiang Dao District, Chiang Mai, Thailand. From 13 July - 30 July, 2002. Support by Singapore International Foundation (SIF). 2. Submitted to: all organization, foundation, association and club. The distinction of social status is one of the main reasons that causes problems for poor students in Thailand. Especially those who live in the poor slum areas and villages of Chiang Mai Municipality . They lack the opportunity development and improvement in their lives, because their families live in very poor conditions. They live in very bad environments such as the crowded of housing and people. The housing plan is not in perfect order with a lot of pollution such as garbage disposal and noise. Not only do they have contaminated food and water, they also get involved in drugs and crimes which are becoming increasingly more violent. For the above reasons the TYCF, under the permission of the Thai National Cultural Council & TYHA, Chiang Mai have as its aim to help and improve the quality of lives of the poor students whether they live in the city or in the rural areas. Thus the foundation has formed “A White Young Jumbo of the Community Poor Village” project. 1. To help young students improve their competence and realize their potential. 2. To help those poor students who do not have the opportunity to improve their lives in society. 3. To help in the sharing of burdens belonging to both government and private organizations that are responsible for solving problems, especially drug addictions. 4. To train young people to be self-reliant and be good example leaders for their families and role models in society. The site of our community service project is a rural hill tribe village school situated in the heartland of Northern Thailand. The student population totals about 180 and consists of young children to teenagers looking forward to gaining elementary education in an area far too secluded for any proper educational infrastructure. The students, originating from various different hill tribes communities in the region, congregate in the school under one roof to learn the Thai Language (most speak tribal dialects), Mathematics and simple art and crafts skills at the village school. Most of them stay in the village premises and return home only once every week or fortnight due to the long travelling distances. The school is supported by a local charity and welfare organization and has the endorsement of the Royal Thai family. However being a school of hill tribe origins in a country where non-indigenous people are not granted the same welfare entitlement by the government, the school relies mainly on funds and donations from the local non- governmental organizations and bodies. While basic infrastructure in the village school is already established, some basic necessities are still sometimes, seasonally, lacking. A proposal to provide the fund and materials for the community to start a fish farm, chicken farm and vegetable garden. 1. To provide food and nutrition for the daily lunch needs of the large number of student. 3. To improve the nutritional habits of the students and local community, which is based on a solely carbohydrates-based diet. 4. To create opportunities and some skills to the local students, who will take up the task of caring for the farms and gardens thereafter, with guidance from the teachers. Location: R.O.Yama School, Ban Pa Ka, Fang district, Chiang Mai province. Member of the Rotaract Club of National University of Singapore all ready for their community work, build water tank, toilet and water system at R.O. Yama school, Ban Pa Ka, Fang district, Chiang Mai. 5 – 21 Dec, 2003. 1. This project aims to improve the living standards of Huay Fak Dap Village. 2. The location of the school in the mountainous region of Northern Thailand means limited access to a constant supply of water for daily use. Currently the entire village shares 1 water-tank. 3. The school is subsidised by the Thai Royal Family with 2000 Baht per month for daily meals of the student population. 1. Project Reaching Out/Zhan Chi 2003 has proposed collaborating with YEP to build 5 water tanks, 1 school canteen and a vegetable farm. 2. The project is to be completed in 2 weeks, in collaboration with the villagers and teachers. 3. 2 representatives from Thai Youth Community Foundation & TYHA, Chiang Mai will join the project as members and translators.